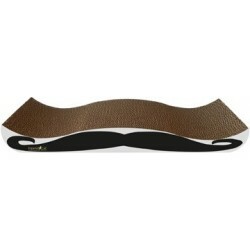 These cat scratcher designs will delight any sports enthusiast! Great for family rooms, dens, and man caves! 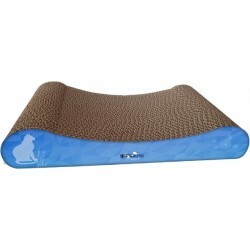 USA Sporty Cat Scratchers There are 7 products. Get set for game time with this unique M.A.X. Nesting Football Scratcher - purrfect for every football fan! 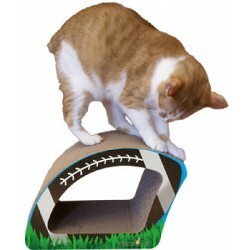 Made in the USA from renewable corrugated cardboard and are completely safe for your cat!Large football measures approx. 15.25" L x 8" W x 9 3/4" H and small football measures approx. 9" L x 8" W x 6 1/2" H.
Our M.A.X. Kitty Canoe is ready for a scratching adventure! And when kitty has had enough scratching fun, the M.A.X. Kitty Canoe Cat Scratcher is the purrfect place for a cat nap! Measures approx. 17 3/4" L x 9" W x 3 1/4" H.
The M.A.X.Convertible measures approx. 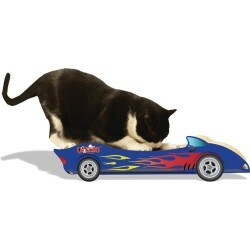 23" long by 9" wide, so your cat will be nice and comfy 'cruising' in this convertible! Includes catnip for ultimate scratching experience. 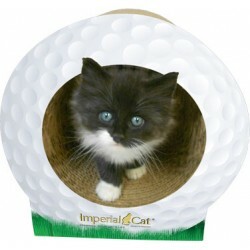 Made in the USA from renewable corrugated cardboard and are completely safe for your cat! 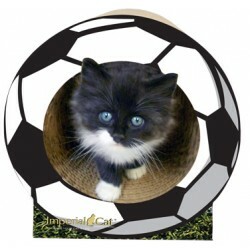 Our sporty Soccer Ball scratcher scores high with cats that like to scratch! Made of corrugated cardboard. Pets can scratch and play. Made of corrugated cardboard. Protects home furnishings from unsightly scratch marks.